Texas Hillel and Texans for Israel held their 17th annual Israel Block Party on Wednesday. For the first time, Israel Block Party organizers set up discussion tables in the East Mall, where students could talk to others and express their opinions. 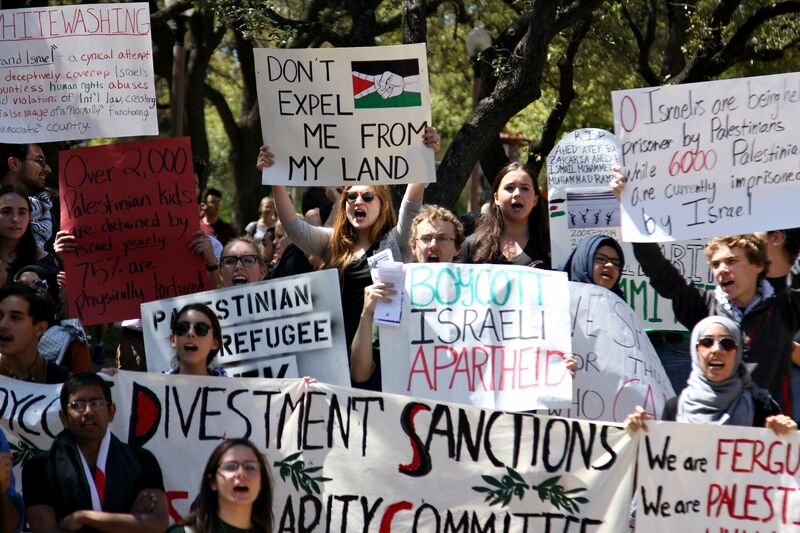 While more than a thousand students came to celebrate Israeli culture at the Israel Block Party on the East Mall, dozens protested the party from feet away. Texas Hillel and Texans for Israel held their 17th annual block party, where students stopped to enjoy Israeli food, participate in discussion and take selfies with camels. From across the street, the Palestine Solidarity Committee held a protest, as they have done almost every year the event has occurred. Moriah Sonsino, Israel Block Party co-chair and international relations and global studies sophomore, said the party is not a political statement. Ali Khan, an economics and computer science senior who helped organize the protest, said he believes the party adheres to a pro-Israeli political agenda. “Our biggest goal is to send a specific message [and] express exactly what we feel the block party is doing, which is a propaganda event which hides a very heinous reality of cultural appropriation and genocide,” Khan said. A group of students from the Palestinian Solidarity Committee held a protest across the street from the Israel Block Party. The committee believes that the party is a propaganda event. For the first time, Israel Block Party organizers set up discussion tables in the East Mall so students could talk to others and express their opinions. The event also had multiple booths on different topics, including human rights, diversity, politics and innovation. Khan said crimes committed against Palestinians are depicted in the media as “normal,” but that doesn’t make them acceptable. In the days leading up to Israel’s national elections last week, prime minister Benjamin Netanyahu said he would never support the establishment of a Palestinian state. Netanyahu, who is now working to form a new coalition government, had previously said he supported a two-state solution. Since the election, Netanyahu has retracted his statement, but Mohammed Nabulsi, a law student who helped organize the protest, said he believes as long as Netanyahu is prime minister, unrest will only continue. Posner said the intention is still to celebrate Israel and its culture despite the political protest.